With a changing legal landscape, increasing regulatory compliance, and global economic uncertainties, corporations—foreign and domestic—are under greater pressure to meet their business objectives in a more cost-effective way. In this evolving corporate environment, in-house counsel shoulder additional responsibilities—wearing many hats as business advisor to the corporate employer, salaried corporate employee, and legal counsel to the corporate client. This rather complex assortment of functions can occasionally lead to conflicting–and often competing–loyalties. Are in-house counsel to act as officers of the court, upholding principles of professionalism and ethics while enforcing compliance with applicable laws, or are they to blindly protect the confidences and further the interests and objectives of their corporate employers without regard for legal and ethical compliance? These issues can give rise to unique ethical, moral, economic, and business dilemmas. This is because in-house counsel are ordinarily exposed to sensitive internal matters that could increase the potential for situations where it may be appropriate to blow the whistle on clients. Suppose an in-house counsel detects corporate wrongdoing. Would reporting such conduct violate the ethical duty of confidentiality and loyalty owed to the client and breach the attorney-client privilege? Or would the failure to disclose and report such unlawful activity constitute a violation of law and related ethics rules on reporting company wrongdoing? Can a fine balance be struck? Aside from federal and state laws and regulations containing reporting and disclosure requirements related to improper corporate activity, guidance is available under the American Bar Association Model Rules of Professional Conduct (Model Rules)1 that govern a lawyer’s professional conduct. Most U.S. jurisdictions have adopted professional conduct rules that are largely based on the Model Rules, but there can be wide discrepancies in how closely the states’ ethics rules resemble the Model Rules. Moreover, many of the states that have amended their ethics rules to follow the professional conduct standards and whistleblower protections provided by federal or state law have adopted amendments that are not identical to the statutory and regulatory standards, nor consistent with other states or the Model Rules. Thus, there is potential for conflict between the application of the statutes and regulations and the state ethics rules. In addition, the interaction of the ethics rules themselves displays how complex and nuanced these rules are. Take for example, the fundamental duty of confidentiality owed to the corporate client (Model Rule 1.6) and the obligation to report an organizational client’s wrongdoing (Model Rule 1.13). These two ethics rules are complex and nuanced, vary state-to-state, and require careful analysis. Notably, in-house counsel, who are regulated by these ethics rules (and existing laws and regulations), need to pay very close attention to how broadly or narrowly these rules and laws are written in the jurisdictions where they are licensed or admitted to practice, so that their conduct does not fall below the lines of permissible ethical and lawful conduct. The Model Rules highlight a delicate interplay between the duty of confidentiality to the corporate client and the limited disclosure exception that permits in-house counsel to reveal confidential client information. Model Rule 1.6 prohibits an attorney from divulging confidential information related to the representation of a client, unless the client consents or if permitted by one of the express exceptions under the Model Rules, including, for example, to prevent a client’s crime or fraud, to establish a claim or defense in a dispute with a client, or to comply with other law, etc.. However, buried in Model Rule 1.13–the rule that regulates representation of organizational clients–is a narrow exception to the confidentiality obligation. That exception permits in-house (and outside) counsel to disclose confidential client information without client consent and to externally report illegal corporate activity whether or not Model Rule 1.6 permits such disclosure, but only if, and to the extent that, counsel reasonably believes it is necessary to prevent substantial injury to the organization. Model Rule 1.13 provides an ethical roadmap for the course of action in-house counsel whistleblowers must follow. This process begins with raising concerns with the highest authority inside the organization itself, and then, if dissatisfied with the response, in-house counsel may reveal confidential information outside the organization in an effort to prevent substantial injury to the organization. In several instances in which in-house counsel reported illegal corporate activity, they faced termination by their corporate employers for blowing the whistle. In response, in-house counsel typically filed retaliatory-discharge suits alleging dismissal for refusing to violate their ethical duties, reporting their employer’s wrongdoing, or urging their employers to comply with the law. Courts around the country have taken varied positions on the degree of protection afforded to whistleblowing in-house lawyers. This lack of consistency is problematic for both corporations and their in-house counsel who advise them in matters spanning multiple jurisdictions. In any event, where courts address in-house counsel whistleblower cases, they tend to focus attention on the client-lawyer relationship between the corporation and its in-house counsel and the rules of professional conduct. Recently, in Trzaska v. L’Oreal USA, Inc., 865 F.3d 155 (3d Cir. 2017), the U.S. Court of Appeals for the Third Circuit analyzed whether refusing to violate professional conduct rules constituted protected activity under a New Jersey anti-retaliation law. Trzaska illustrates that in-house counsel’s commitment to upholding professional conduct rules will be rewarded, despite contrary direction from the corporate employer. There, the corporate employer established a patent application quota for its in-house patent attorneys that encouraged them to submit patent applications for products, even if they had a good faith belief such products were not patentable. The state’s rules of professional conduct and those of the U.S. Patent and Trademark Office (USPTO) prohibited attorneys from filing frivolous or bad-faith patent applications or from knowingly making false statements before a tribunal. Due to a deficit in patentable products, in-house counsel informed company management that the legal team was unwilling to file patent applications that they did not reasonably believe were patentable and that doing so would violate the ethical rules. In response, the corporate employer made it clear that the failure to file such applications would negatively impact their careers. Consequently, in-house counsel was offered a severance package and discharged for protesting company directives. Counsel sued his former employer, asserting violation of a state statute prohibiting retaliatory termination of employees who disclose illegal company conduct. That statute protected employees who could identify a law, rule, regulation, or clear mandate of public policy that supported a retaliation claim, as well as unacceptable practices in the corporate employer’s business that contravened the identified authority. The U.S. District Court for the District of New Jersey dismissed the complaint. On appeal, the Third Circuit ruled that the corporate employer’s coercive instruction to file frivolous, meritless, and bad-faith patent applications, notwithstanding in-house counsel’s express recommendation against doing so, contravened the state’s and the USPTO’s professional conduct rules and was a clear violation of public policy. The Third Circuit determined that the ethics rules provided a source of authority enabling in-house counsel to pursue claims of whistleblower retaliation against his corporate employer and remanded the case. Trzaska falls in line with another major decision from 2017, Wadler v. Bio-Rad Labs., Inc. 2017 U.S. Dist. LEXIS 16522 (N.D. Cal. Feb. 6, 2017), that provides similar whistleblowing safeguards for in-house counsel from a slightly different perspective. In February 2017, a California federal jury found that a corporate employer breached whistleblower protections under 15 U.S.C. § 7245 of the SarbanesOxley Act (SOX) when it fired its general counsel for reporting alleged Foreign Corrupt Practices Act (15 U.S.C. §§ 78dd-1, et seq.) violations. The jury awarded the general counsel nearly $8 million in back wages and punitive damages. 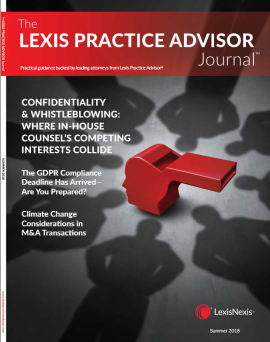 A magistrate judge in the U.S. District Court for the Northern District of California held that SOX whistleblower protections preempt the attorneyclient privilege, thus allowing general counsel to use otherwise privileged and confidential information as evidence in the lawsuit. This case is significant as it creates protection for in-house counsel who, until this ruling, were often afraid to disclose illegal conduct of their corporate employers for fear of violating their ethical obligations to their clients and risking loss of employment and, if actually terminated, being left with little or limited recourse. Both Trzaska and Wadler highlight a possible trend towards expanding whistleblower protections for in-house counsel, while offering guidance on when in-house counsel may disclose client confidences and privileged information without violating their ethical duties. In-house counsel’s relationship with its corporate client can be complicated. As the rights, responsibilities, limits, and protections underlying this unique relationship are tried and tested in courtrooms and boardrooms, ultimately it is the rules of professional conduct that define and shape the client-lawyer relationship. Devika Kewalramani is a partner at Moses & Singer LLP and co-chair of its Legal Ethics & Law Firm Practice. Ms. Kewalramani focuses her practice on legal ethics, professional discipline, risk management, and ethical compliance. She serves as the co-chair of the Council on the Profession of the New York City Bar Association and is the immediate past chair of its Committee on Professional Discipline.